Website design and Joomla! content management system (CMS) development in the Pioneer Valley of western Massachusetts. Contact me for a free estimate. Hooray for the new site—it’s incredibly gorgeous! Please put me on your list of references so I can tell your prospective clients how much I love working with you! Before we begin, you should first know what I'm not: I'm not a big Web design company with a big budget and tons of employees. This means that I can respond to your needs and get to know you as a person and a respected client, not a number - and it keeps the costs low. I'm also not an über-geek who only speaks in technical jargon. I'm always happy to meet you at your level, even if you hate computers and just want to wash your hands of this whole business. I'll take the time to explain what you need to know and not bury you in gobbledygook. I'm a Web designer who's been around the block a little bit. I designed and coded my first, really ugly, personal website way back in 1995, when Amazon and Google were just gleams in somebody's eye. This was while I was in college, and I thought, "What better way to use a bachelor's degree in poetry and theater than to become a Web designer?" In 1997 I got a job designing online training for Oracle Corporation, and I was able to build my skills with the help of some great colleagues there, until my job moved to India in 2003 and I was laid off. This opened up a new opportunity: to start my own Web design business and serve a wider range of clients with sites that looked nice and worked well. That's still my goal, and I hope I can build your dream site. In 2008, I had the opportunity to learn about the Joomla! open-source content management system, and have been building sites with it ever since. It's free, flexible, and constantly being improved. You can learn more about the benefits of Joomla here. My hourly rate is $120, and I pro-rate my fees by the quarter-hour. I offer reduced rates to nonprofit organizations; please inquire. How many hours does it take to build a website? That's kind of like saying "How long does it take to paint a house?" It depends on the size and complexity of the site, and on how quickly the design process goes. Sometimes a design just clicks right away, and sometimes it takes several revisions before it's just right. You can read more about the site development process on the Services page. I'm happy to talk to you about the website of your dreams and give you a cost estimate. There's never a hard sell. Feel free to send me email to tell me more about the site of your dreams. 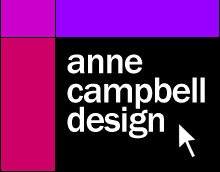 Copyright 2019, Anne Campbell Design.